64 Coverage Issues – Which Is The Most Interesting? 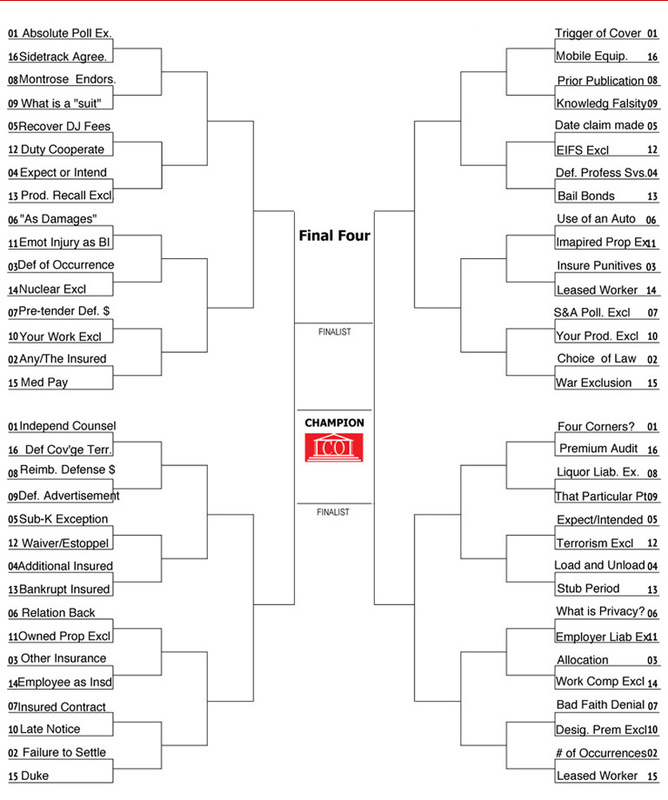 This insurance coverage bracket originally appeared in the March 14, 2016 issue of Coverage Opinions. If you are reading this it means you are wondering if Saint Mary's has a prayer in the opening round of the NCAA Men's Basketball Tournament. Look, your bracket is going to be busted by Thursday night, when that number 8 seed you took to make it to Final Four go down in flames. It serves you right for listening to some expert on ESPN.com. When it comes to the NCAA Tournament bracket, I'd put my money on Mildred from HR over an ESPN expert any day of the week. Rather than be frustrated that you’ve wasted ten bucks on the NCAA office pool once again, fill in the Insurance Coverage Bracket and choose the most interesting coverage issue. You can’t lose – since there is nothing to win. But if there were, you would still lose to Mildred from HR.